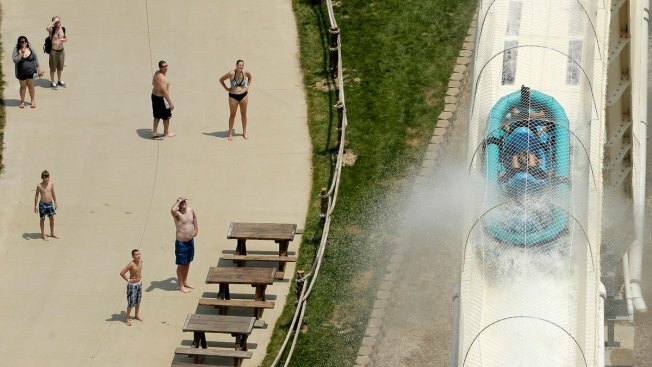 In this July 9, 2014, file photo, riders are propelled by jets of water as they go over a hump while riding a water slide called "Verruckt" at Schlitterbahn Water Park in Kansas City, Kan. Testimony has concluded in the trial of two maintenance workers at the water park who are accused of deliberately misleading investigators after a 10-year-old boy was decapitated on the waterslide. Two Kansas water park workers were acquitted Thursday of impeding an investigation into the 2016 death of a 10-year-old boy who was decapitated while on a ride that had been billed as the world's tallest waterslide. David Hughes and John Zalsman were found not guilty of obstruction of justice in connection to the death of Caleb Schwab, the son of a Kansas legislator. The boy was killed while on the 17-story Verruckt waterslide at the Schlitterbahn water park in Kansas City. Zalsman's attorney called the prosecution "sloppy" and accused the attorney general of overreaching in an attempt to push innocent men to turn on employees higher up in the company. The attorney general's office did not immediately respond to a message seeking comment. Hughes and Zalsman, both maintenance workers, were the first employees to stand trial in the death. Others have also been charged, including one of Schlitterbahn's owners and the designer of the slide, who have both pleaded not guilty to second-degree murder. The since-closed waterslide used rafts that made the 17-story drop at speeds of up to 70 mph (110 kilometers per hour), followed by a surge over the hump and a 50-foot (15-meter) descent to a finishing pool. Caleb was in a raft that went airborne and slammed him into a metal pole that supported a net meant to keep riders from flying off the slide. Two women on the raft also were injured. The defense said prosecutors didn't understand how the slide functioned and questioned the testimony of Jason Diaz, the Kansas Bureau of Investigation agent who interviewed the defendants. The defense also noted that another Schlitterbahn employee who made false statements to investigators wasn't charged. "These are just two good old boys, they're hard working guys and because they're the only two adults in the room they get singled out and have to get charged ," said Scott Toth, defense attorney for Hughes, as he addressed jurors. Diaz said he didn't believe the other employee had intentionally misled him. Schlitterbahn has said the company had no reason to believe any employee obstructed justice. "We have maintained our belief in the integrity of our staff and respect the process and decision by the jury," Winter Prosapio, spokeswoman for Texas-based Schlitterbahn, said in an email after the verdict. The most serious charges in Caleb's death have been filed against one of Schlitterbahn's owners, Jeff Henry, Verruckt designer John Schooley and general contractor Henry & Sons Constructions. Each is charged with second-degree murder, which carries up to 41 years in prison; aggravated battery; and aggravated endangerment of a child. Another employee is charged with involuntary manslaughter. They have all pleaded not guilty. Their trials have not yet been scheduled. The slide was shut down after Caleb was killed. The boy's father, state Rep. Scott Schwab, a Republican from the Kansas City suburb of Olathe, had no immediate comment after being informed of the verdict Thursday. His son's death prompted Kansas legislators to strengthen the state's relatively lax oversight of amusement park rides. Their 2017 law required amusement park rides to be inspected every year by qualified inspector after previously allowing the parks to do their own. The law also mandated that parks report injuries to the state. The elder Schwab is the Republican nominee for Kansas secretary of state.